Post Address: Apteegi 3, 10146 Tallinn, Estonia. Post Address: Toom-Kooli 6, 10130 Tallinn, Estonia. To develop Cathedral School Library. Tallinn Cathedral School welcomes donations to support our mission of providing the children a good Christian education. According Estonian tax regulations it is easiest to donate to the Cathedral School via Tallinn Dome-Cathedral Congregation (EELK Tallinna Piiskoplik Toomkogudus) non-profit Cathedral School Fund. Please make remark: “Donation to the Cathedral School Fund"
The historic schoolhouse at Toom-kooli Street 11 in Toopea Hill was built in 1691 in place of a wooden structure which had been destroyed by fire in 1684. 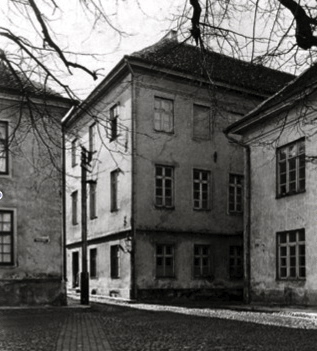 In 1768 another house was acquired for the school, the boarding house. In 1845 the building was thoroughly reconstructed and the school moved in. The house has been rebuilt during the 20th century as well. The present Classicist look of the building dates back to the 19th century reconstruction during which its original plan was changed to such an extent that the earlier division of space is not observable any more.